I don’t know many people who are vegans, but many of my friends don’t eat meat, or in some cases fish, so finding a good vegan place allows for more choices for them than trying to pick out an item or two from a menu that is geared towards omnivores. 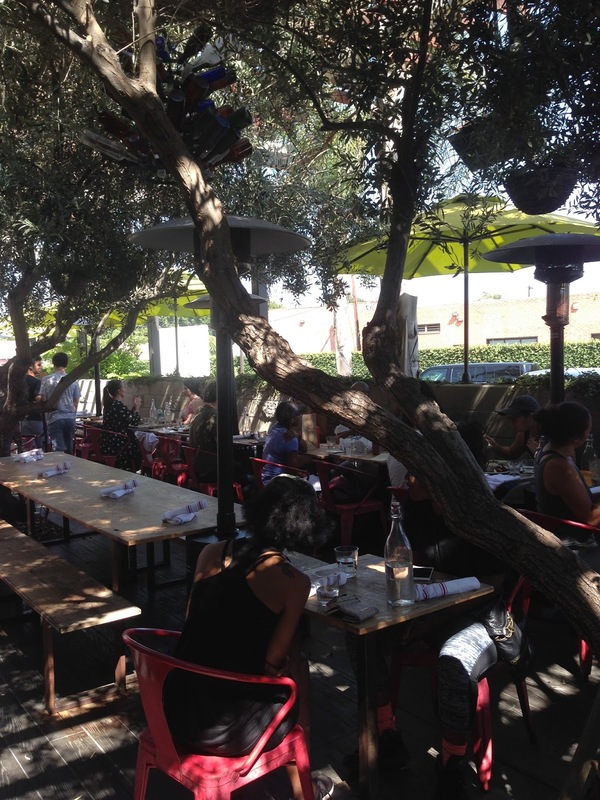 Sage has several locations; the one I went to in Culver City has an enormous tree growing in the middle of the outdoor patio, naturally providing shade and atmosphere to the wooden tables. The menu has many options for drinks, from smoothies to mixed drinks. For a boozy brunch, you can even order bottomless mimosas for $25. 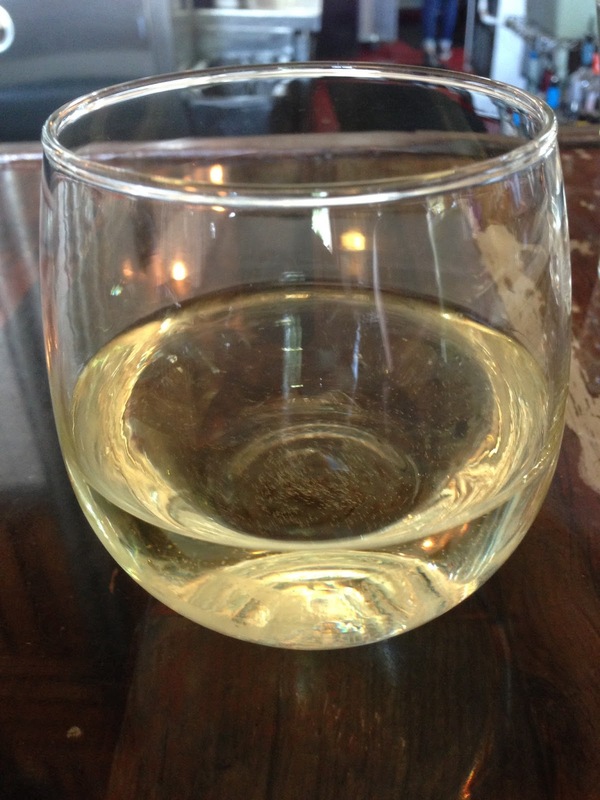 I opted for a glass of wine. 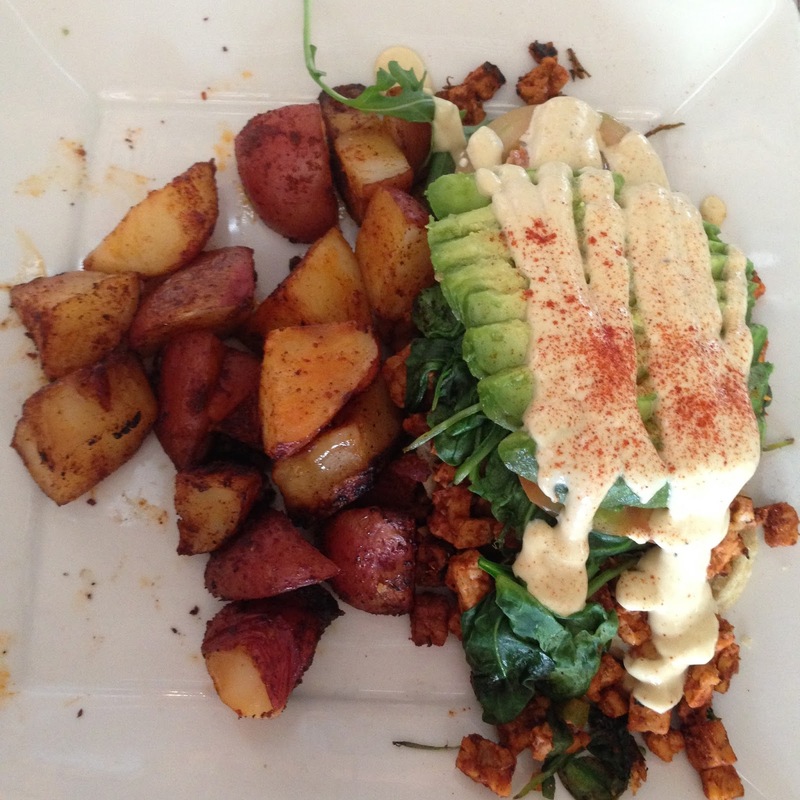 Since I met my friend for brunch, I chose the tempeh sausage florentine for $15 with three biscuits topped with tempeh sausage, heirloom tomato, spinach, avocado, and hollandaise sauce with roasted potatoes. I enjoyed everything except the doughy bland biscuits. One one visit the man sitting next to us offered us one of his jackfruit “crab cakes” saying it was his favorite thing on the menu and the portion was too big for him to finish. We took one and tried it, but neither one of us enjoyed it enough to order it. My friend ordered the hot wings for $14. Tempura fried cauliflower with a buffalo sauce that was the most addictive thing on the menu! It was a large portion, easily enough for a meal or for two to share. If you only order one thing here, order this! 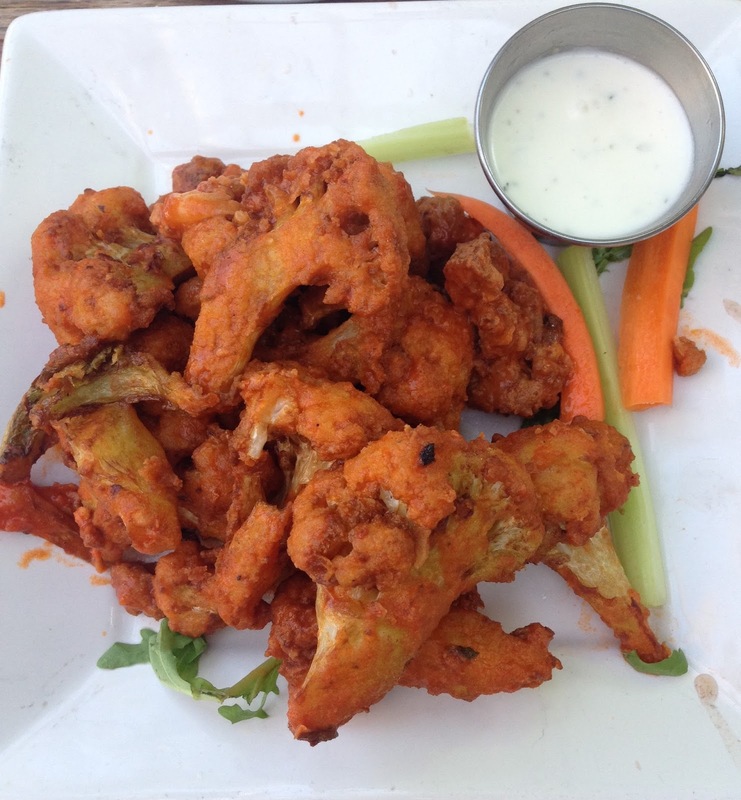 The ranch and crudités that come on the side make for a nice fresh contrast to the spicy “wings”. 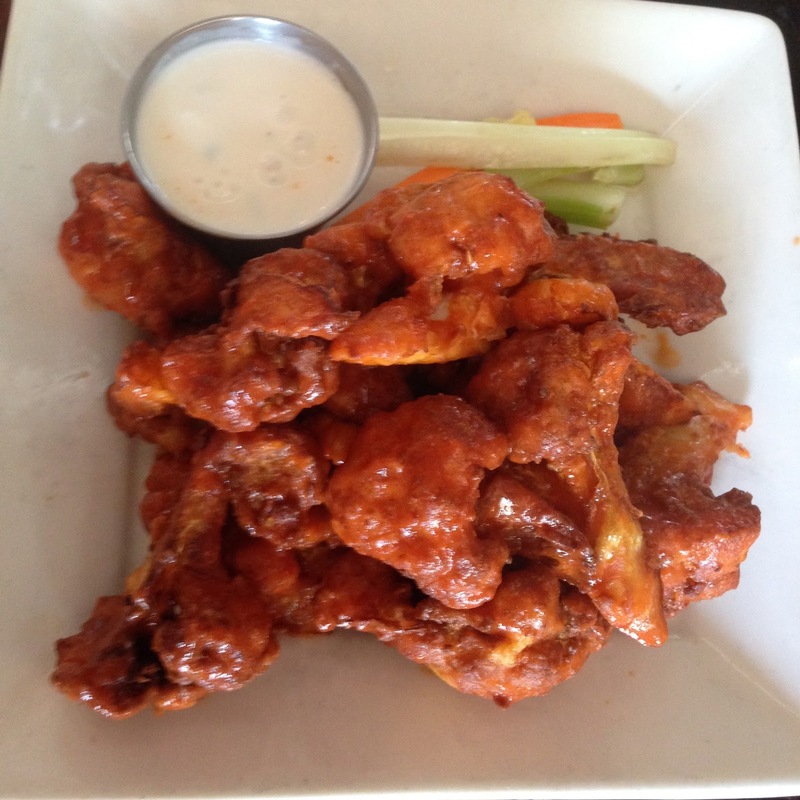 On another trip, the wings came with more sauce and were even more delicious. 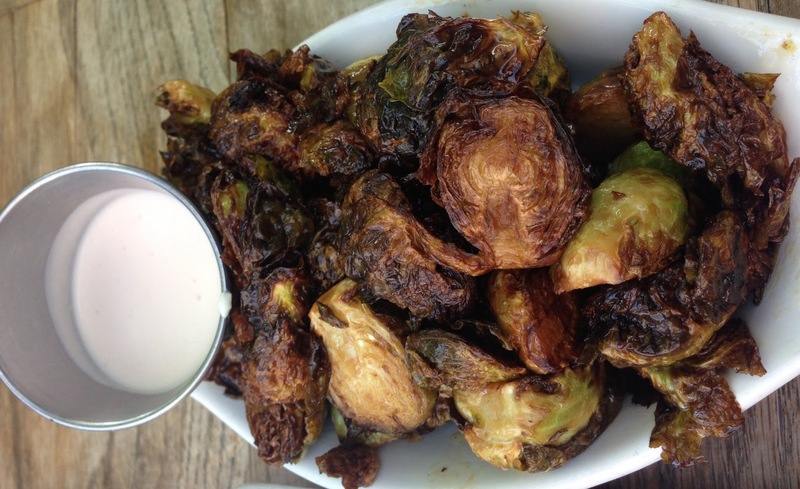 The fried brussel sprouts with lime and salt were also a great item to share for $11 and if you order the cauliflower wings, this is the perfect compliment for a full meal. We started off at Belcampo with their $14 lamb burger, made with garam masala aioli, tamarind chutney, mint, cilantro, and red onion on a wonderfully soft bun. I love that all their meats are grass fed and that they have complete control of every aspect of their operation from raising the animals to processing and butchering them. Yes, the prices here are higher than your local chain grocery store, but I prefer to buy less from places with practices I want to promote, than feed the corporate machinery. 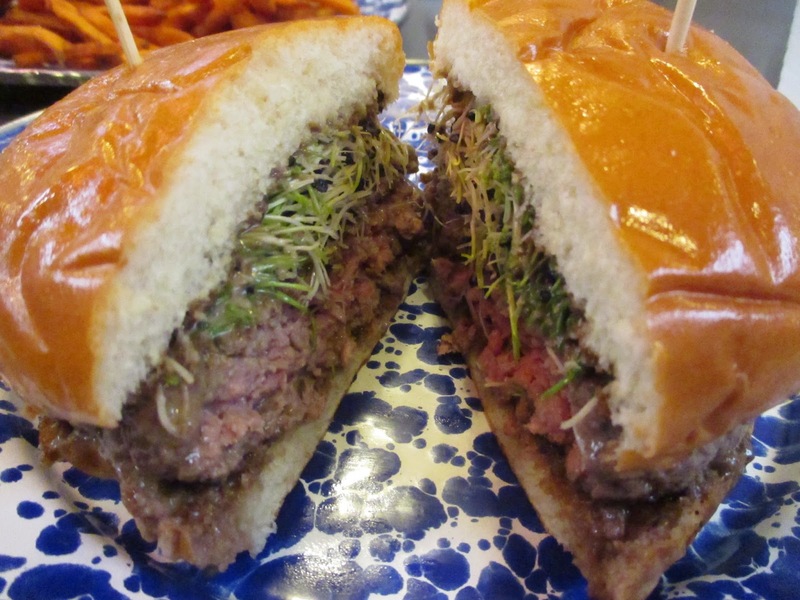 We split the medium rare burger and loved the textures and flavors. If we had not planned to try other places in the market, we would have eaten one of these each! 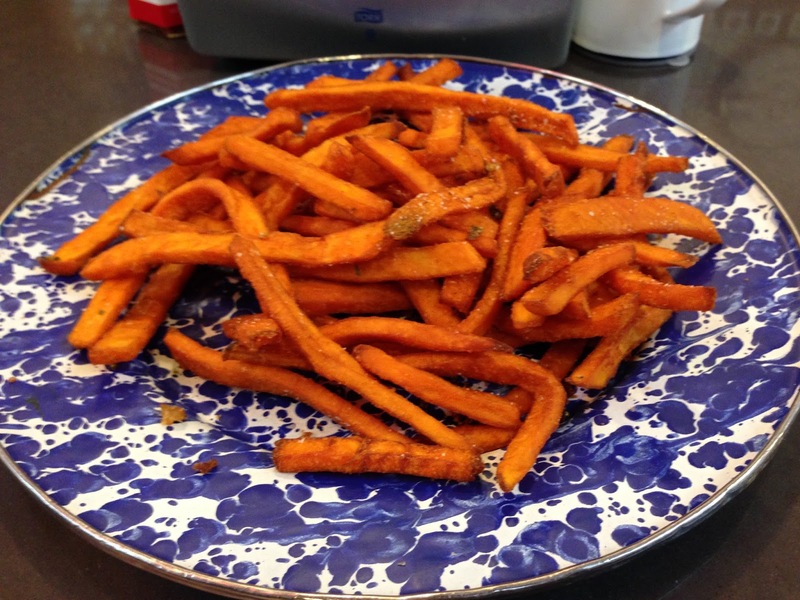 We also shared a plate of the sweet potato fries, seasoned with celery salt, and they were so crisp, salty, and sweet that we fought over the last fries! Ramen Hood was our next course. 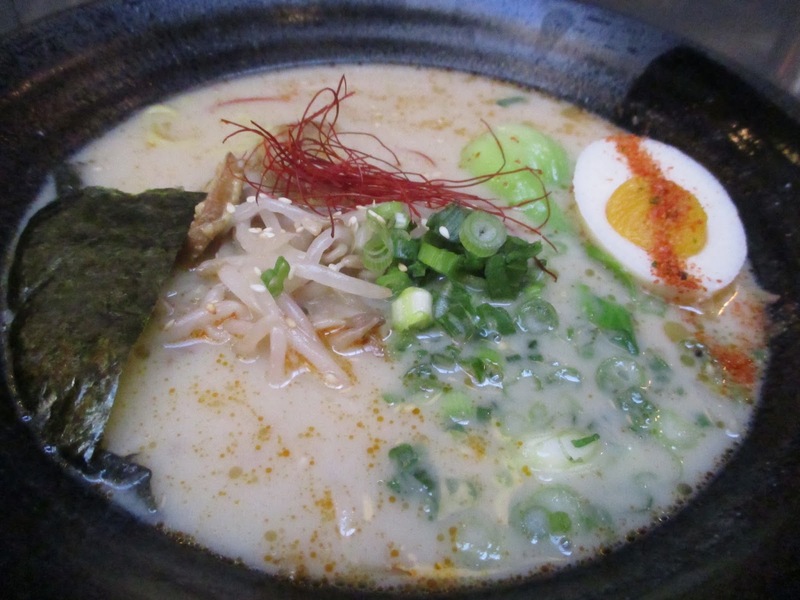 It was the only vegan ramen I’ve ever tried, with sunflower seed broth, king oyster mushroom, bean sprouts, scallions, and chili threads, we added a vegan egg for $2 more making the total bowl $12. It was much better than we imagined, with full flavors and the “egg” not only looked like an egg, but the texture was very close to one. A satisfying bowl, but next time I think I would try the spicy version that I saw my neighbors eating at the counter simply because I think some added heat might enhance the flavors even more. We were pretty full but wanted to try a small bite at Madcapra, made with locally sourced organic ingredients, so we got just the green falafels for $3.50. They were dry and bland on their own, but once we added the dipping sauces, they were good. Sticky Rice serves organic locally sourced Thai comfort food, like this rice noodle plate with beef that was so big I had to take half of it home! The assortment of condiments was a very nice way to add heat and zing to any dish on their menu. If you have been following my blog or Instagram account, then you already know I am an omnivore. I am truly an omnivore in the most literal sense; I love things like fish eyeballs, raw oysters, snails, beef tongue, tripe, duck feet, veal kidneys, and lamb pancreas. Really. Love. Eating. All. That. When a talented chef is at the helm, I even love sea urchin in pasta, grazie Sal for showing me the light:) The flip side of all the animal I eat is that I also eat and enjoy many vegan and vegetarian dishes. The key for me is the talent of the chef. 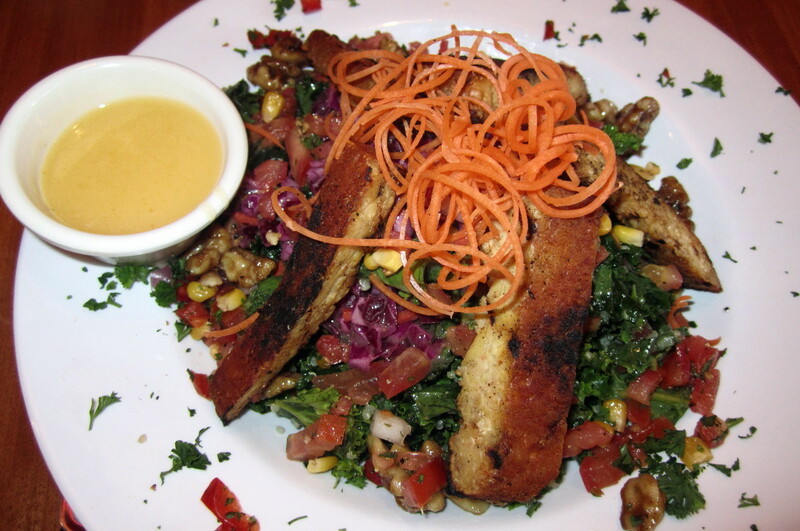 One of my favorite vegan dishes of all time was the Jerk Salad at Native Foods before it was taken off the menu. I have a few vegetarian and vegan friends, so finding places that serve foods they will eat and that I like is a rare and wonderful experience. 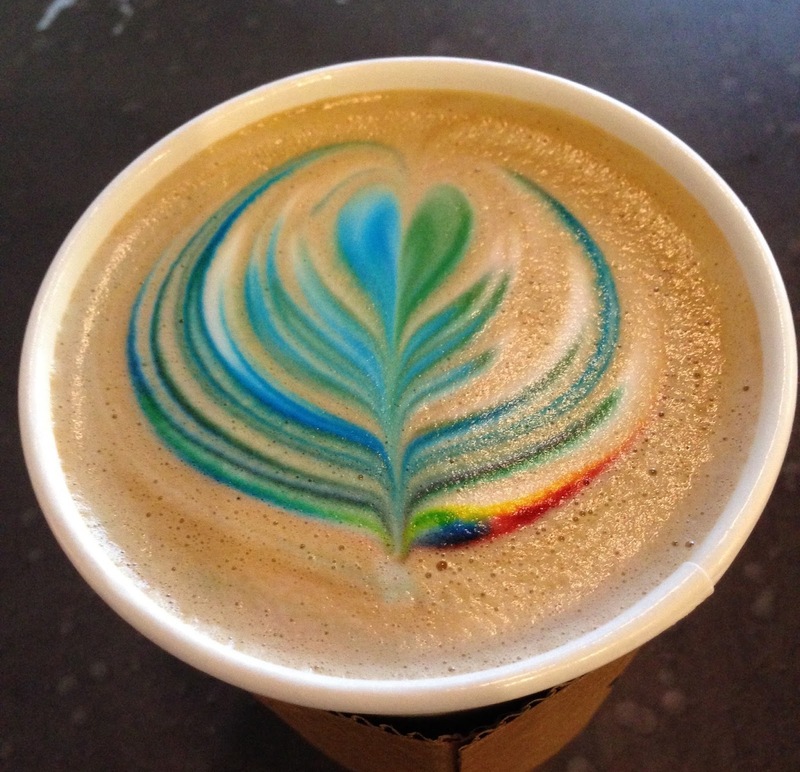 By Chloe is an New York transplant which now has one location here in CA. It is a 100 % vegan cafe, but in light of recent news, the founder has left the brand (or was fired), so we shall see how this all plays out. For now, I can say that I loved everything, from the clean aesthetic and the environmentally thoughtful utensils, to the flavors in every bowl. The $10.95 Kale Caesar with shitake bacon, avocado, tomatoes, almond parm, maple wheat croutons, and caesar dressing was probably my favorite of all the salads we ordered. The shitake bacon was addictive! 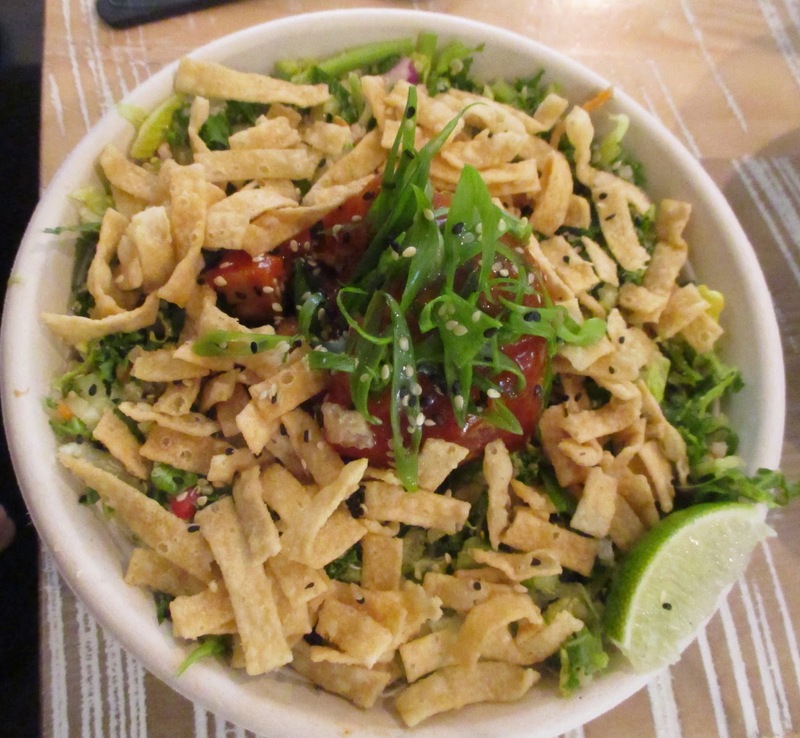 The $11.95 spicy Thai salad with apricot sriracha glazed tempeh, almonds, quinoa, edamame, scallion, and crispy wontons with peanut dressing, had a nice balance of textures. 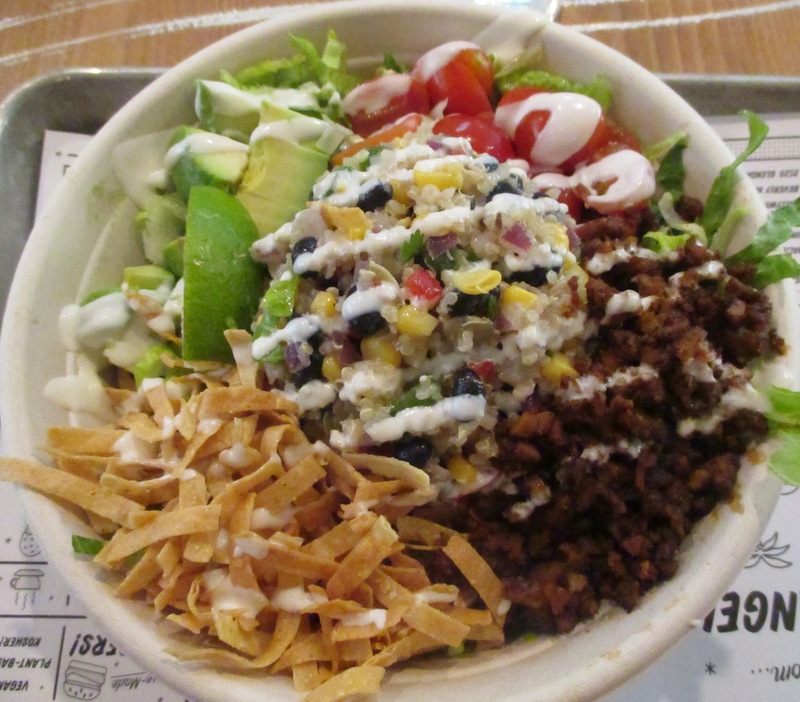 The $11.95 Quinoa Taco salad with spicy seitan chorizo, black beans, sweet corn, avocado, tomato, tortilla strips, crema, and an agave lime vinaigrette, was filling and fresh. 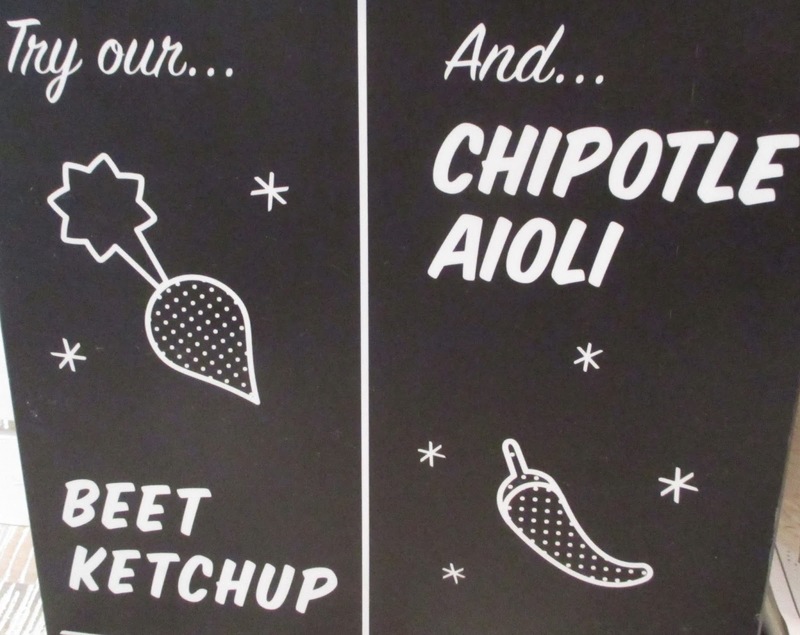 They have burgers and fries, and of course vegan condiments for both. 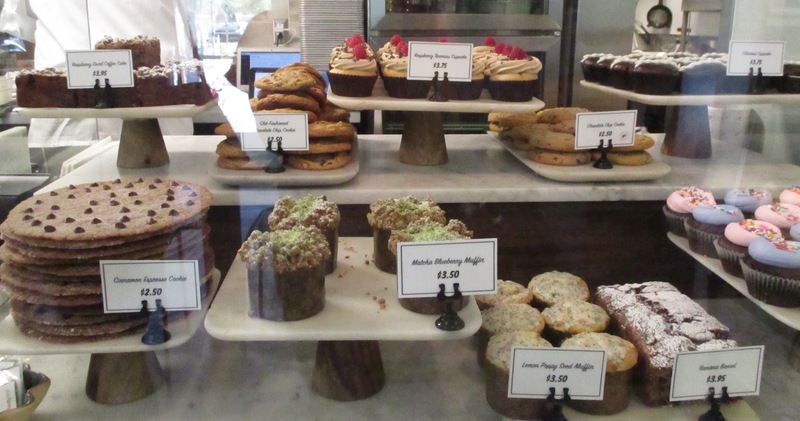 Desserts galore, including a few gluten free options. The Seasonal Ingredient Salad was a hearty mix of seasonal vegetables for $14.50 that was so umami rich, that my friends could have easily eaten twice the small serving. Cafe Gratitude is one of those places people will either love or hate. 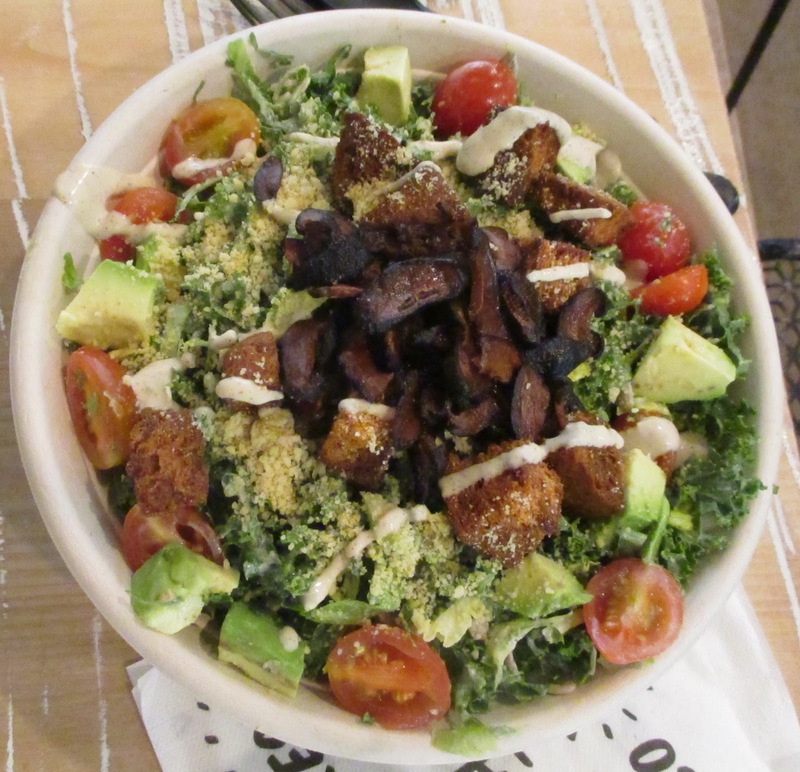 With locations in Santa Cruz, Venice and Larchmont, it is the epitome of 100% organic vegetarian California cafés, including a spiritual vibe and raw/vegan options. If you’re still reading this, then you either live in California or are OK with eating a meal without any meat or fish. Since I get my weekly rations of meat at Lindy & Grundy, I have no problem going vegan for a meal or two. They offer beers and wines by the glass from $5-12, but I decided that since I was going meatless, I would also go without alcohol while I was here. It was fitting that I chose the drink called I Am Healthy for $5.25. 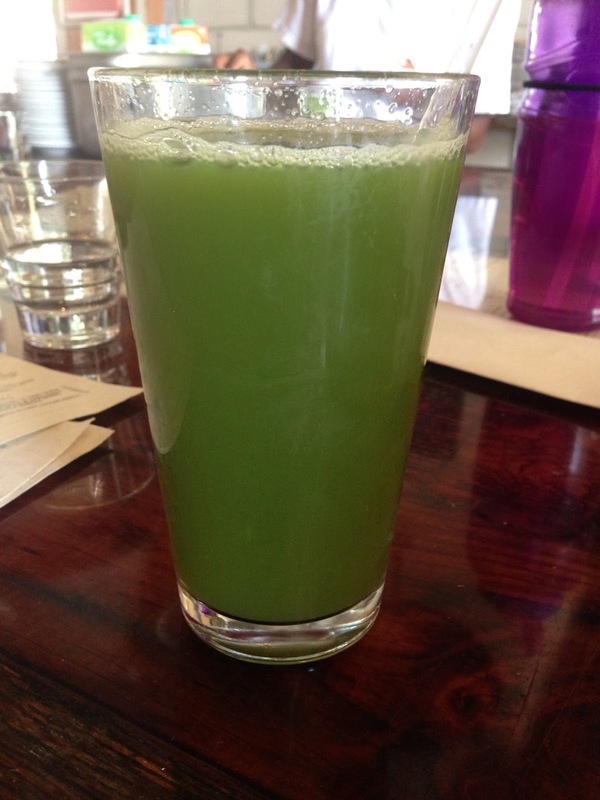 Made with cold pressed vegetable and fruit juices, it was a refreshingly simple mixture of cucumber and pineapple juice. Every drink and dish is listed as an affirmation so when you order it you must say it. Yes, I know some of you are rolling your eyes now, but I think it’s a better idea than naming a three pound burger a Triple Bypass (however appropriate that name may be). Staying with my clean meal theme, I had the I Am Pure salad for $13. It’s a ginger tahini marinated kale salad with avocado, sea palm, nori, cucumbers, carrots, cilantro, basil, green onions, sunflower sprouts, and sprinkled with teriyaki almonds. It was indeed pure and I loved the ginger tahini marinade which tenderized the kale without overwhelming it. The sunflower sprouts were a bit hard to eat because they were so long, but the varied textures of the ingredients and the savory dressing made this a delicious way to eat vegan. I came on another day when my stomach was not happy after a heavy meal the night before, so I ordered the I Am Fiery, a digestive 1 oz shot for $3.50. 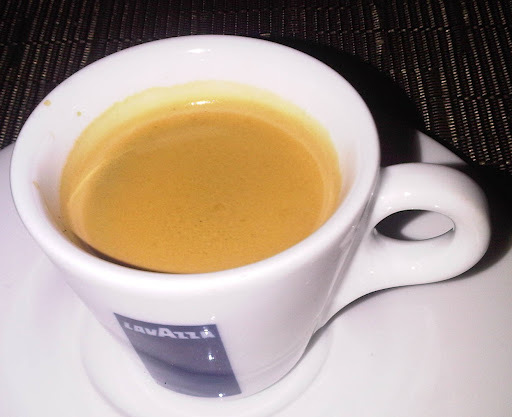 Made with Noni, ginger turmeric, cayenne, and colonial minerals, it is spicy and it definitely cleared out my system. Do not order this if you can not handle heat; it is about as hot as diluted Tabasco in a shot! The neighboring table had two I Am Awesome sandwiches and they looked so good, I ordered one too. It’s a herb cornmeal crusted eggplant Parmesan on grilled panini with marinara, cashew ricotta, sliced heirloom tomatoes, arugula, basil, and served with a side salad for $12. 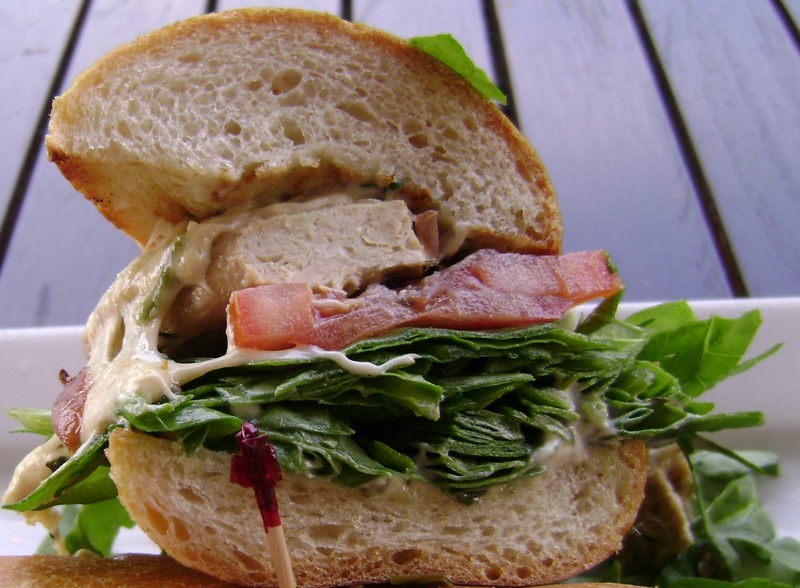 This is the perfect sandwich to order for someone who isn’t sure they like vegetables. The crunchy cornmeal crust with the creamy ricotta and fresh tomato marinara tasted just like a fresher version of the traditional eggplant Parmesan sandwich. There is an option of hemp seed pesto with this sandwich for an additional $2.25, but I felt the flavors were fine without any addition. The side salad dressed with a balsamic dressing was as tasty as the sandwich. All their teas and coffees are also organic, and they offer desserts, but since I rarely have room for anything after my main meal, I did not partake of either. Other tables did order desserts, so I can only surmise that the mostly coconut based sweets are as good as their other offerings. Parking in this area of Venice can be tough, but the restaurant will validate for the parking lot on 5th Street. 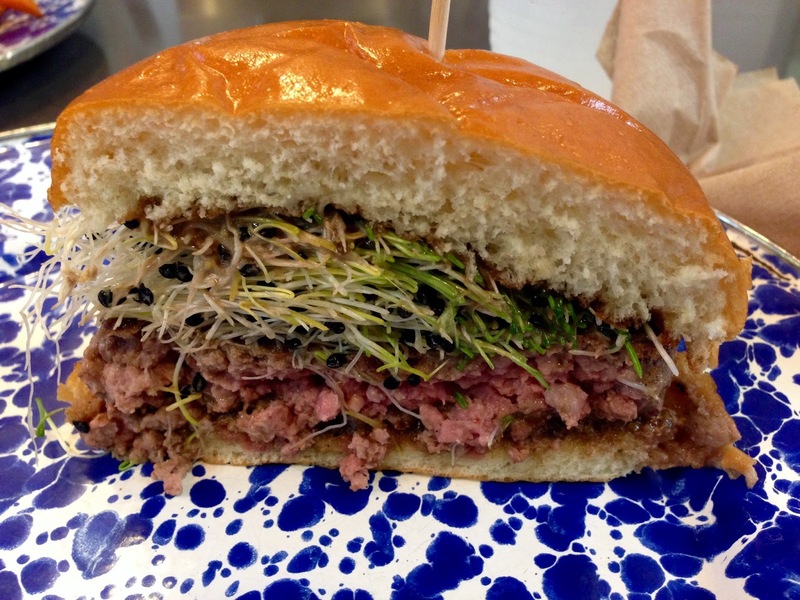 After reading the Actor’s Diet blog post on True Food in the new Santa Monica Place Mall, I had to try it, and the ideal time was with a vegetarian friend in town for his birthday. With the proliferation of all things healthy and holistic in Los Angeles, it is still rare to find places that serve food omnivores and vegans would eat in the same restaurant, even more rare are places which do a good job with both types of eaters and which have a decor which feels upscale enough to take a friend for a birthday celebration. Whether you are a meat eater, a vegan, need gluten-free choices, or vegetarian choices, there are choices on the menu for you. That is choices (plural) for everyone. Their menu is noted with V, GF, and Veg so you can choose your items in accordance with your preferences. I was impressed that they had a nice international selection of wines starting at only $6 a glass, and even their wine and beer list has notes on whether the glass or bottle you choose is bio dynamically farmed, certified organically farmed, or sustainably farmed. 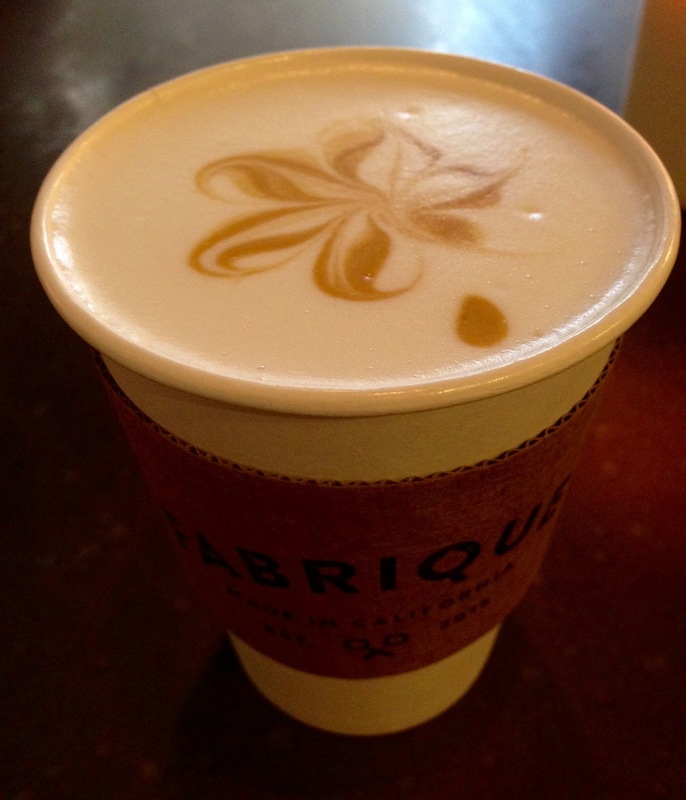 Their coffee and tea selections are of course organic, and if you take half and half in your coffee or tea, that is also organic. 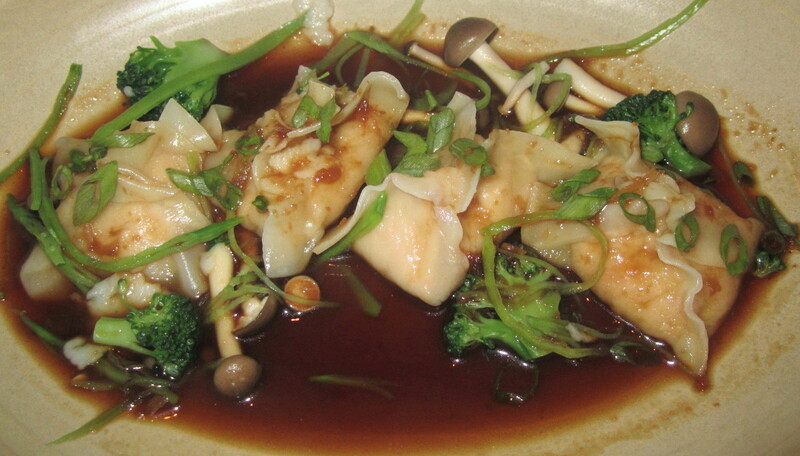 Since it was Jersey’s Birthday, he started with the Shrimp Dumplings with shiitake mushrooms, ginger, broccoli for $12. Even though he had offered to share, he could not stop eating “just one more” until he finished the appetizer. I did not want to diminish his plate by tasting one, but I did try the broccoli and the sauce, which had a nice light and slightly sweet flavor. Mika and I split an order of the Monterey Bay Grilled Sardines with salsa verde and grilled lemons $10. They were grilled to perfection and the salsa verde and grilled lemon slices added a nice freshness to the fatty fish. I asked the waitress if many people ordered the sardines and she surprisingly said, “Yes”. Perhaps Los Angelenos are beginning to broaden their fish preferences to more than the usual salmon found on every menu. For those of you not familiar with fresh sardines, be forewarned that there are many many tiny bones, so it will take some work to get bites of the tender flesh. 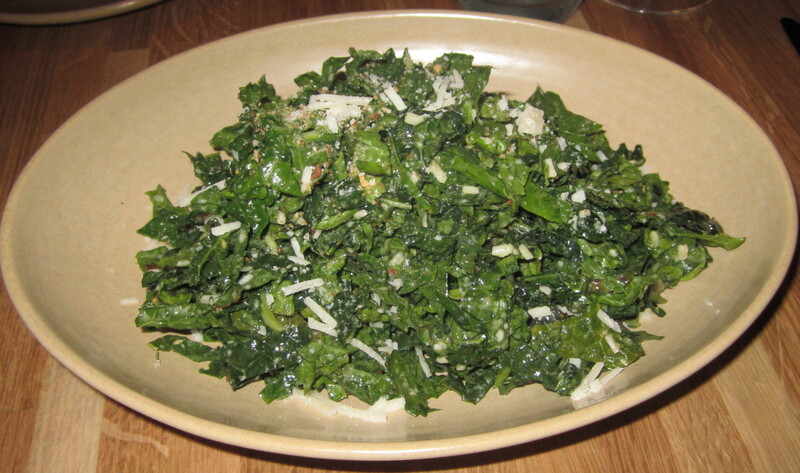 I had eaten a very hearty lunch, so my dinner was the Tuscan Kale salad with lemon, Parmesan and bread crumbs for $8. You can add grilled chicken or salmon to this, but since I had eaten the sardine, this was perfect on its own. 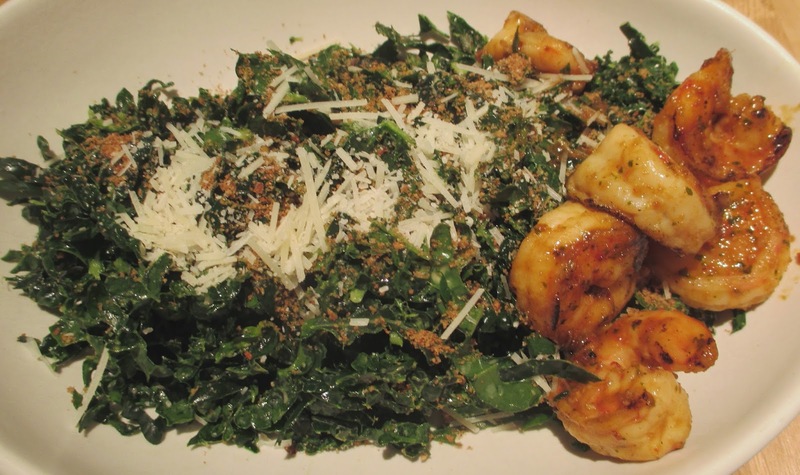 The tangy lemon and the flavorful Parmesan made the kale a hearty and satisfying dish and I could easily eat this several times a week for lunch. 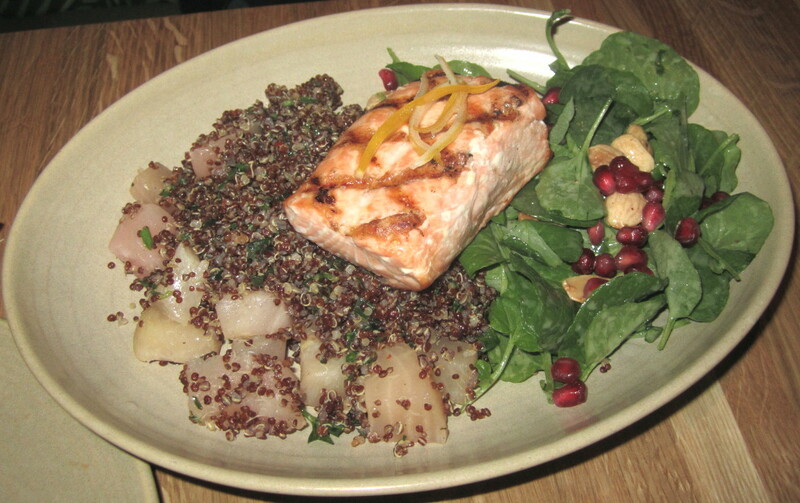 The Birthday boy chose the King Salmon with quinoa, local beets and preserved lemons for $24. He requested the salmon to be done rare and was afraid it would be overcooked, but he was happy to find they had cooked it to his preference. 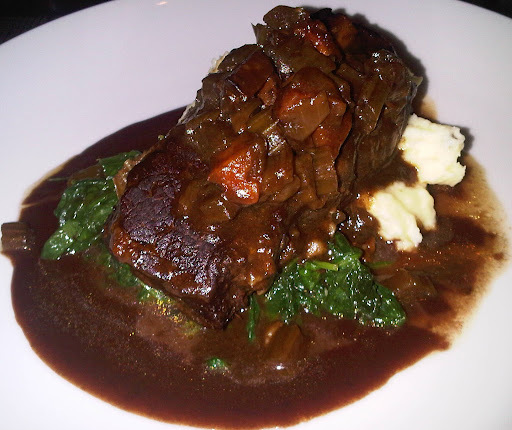 He was a bit taken aback by the “small” portion, but after he began eating his dish, he wasn’t able to finish it all. He had never tried quinoa and was happy to find that he liked it. 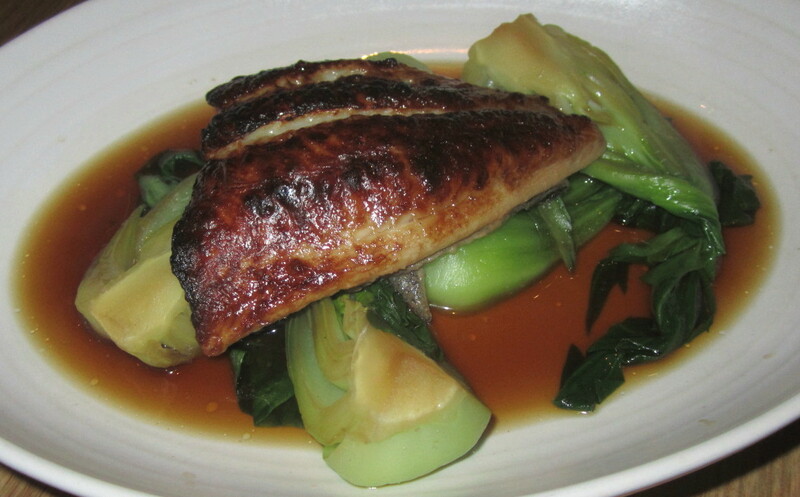 Mika ordered the Miso Glazed Black Cod with bok choy for $24 based on the waitress’ suggestion and she loved it so much she literally screamed “Oh my God” after taking a bite. She insisted we all taste it and it was delectable; perfectly seared, just to the point of doneness, with a marvelous miso glaze. 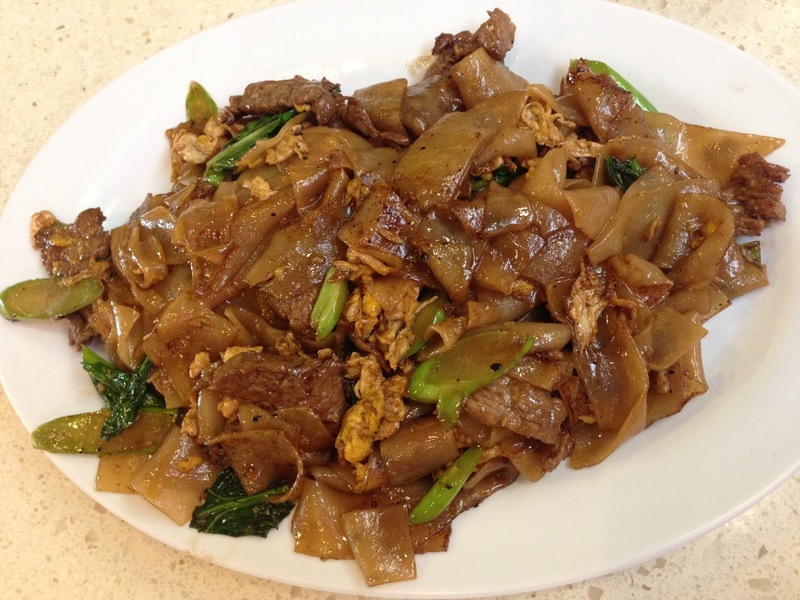 If you only order one dish here at dinner, order this one. 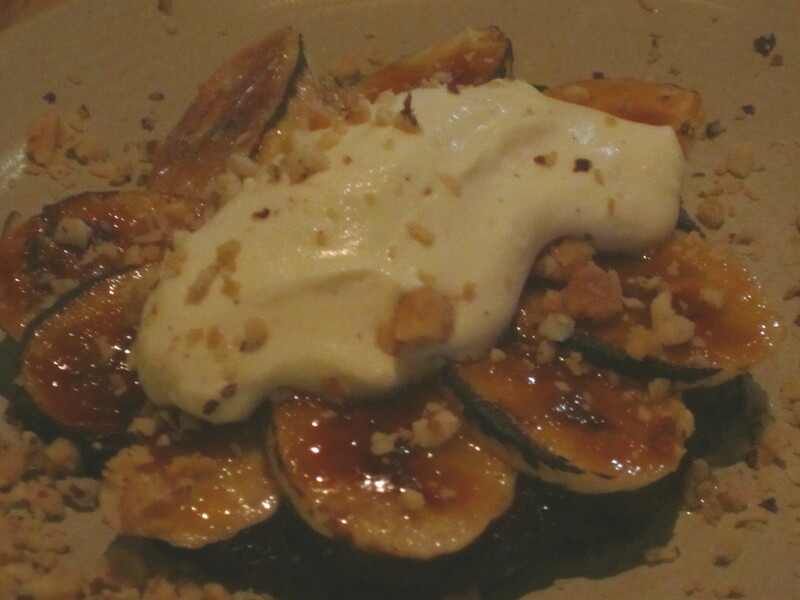 Mika loves bananas, so she ordered the banana chocolate tart with a mesquite flour crust, and brazil nut $6. She didn’t like the hard crust, but loved the flavors. I like the tart, but I would describe it as more of a hard cookie than a crust because there was no way to eat this with a fork, you had to hold it and bite into it like a big cookie topped with chocolate and banana. 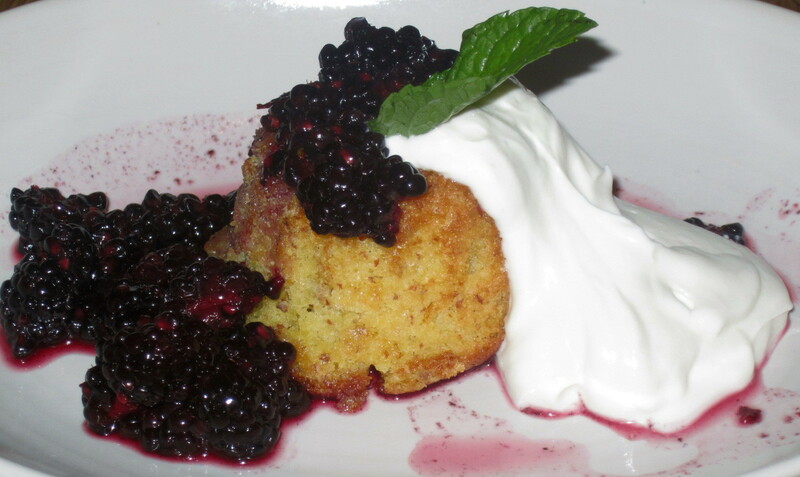 I ordered the Almond Olive Oil cake with blackberries and Greek yogurt $7 so everyone could have a taste. It was a nice rendition of an olive oil cake, very moist and light, and I would have said I would order this again, but then I tried Jersey’s choice. 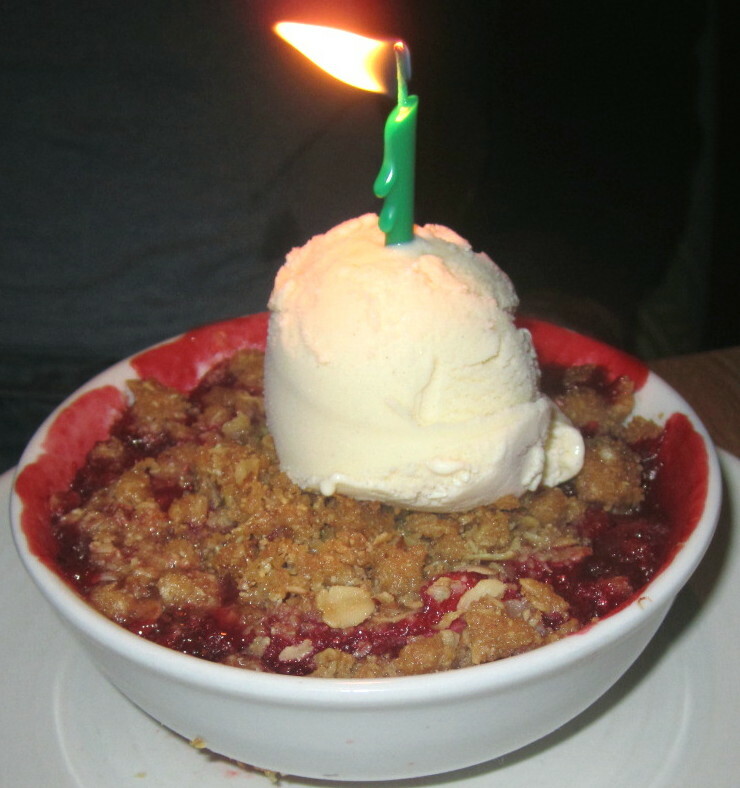 For his birthday, Jersey got a free dessert of Strawberry Rhubarb crisp with vanilla ice cream $7 (he had to fill in a card with his email). I loved the tangy rhubarb and the sweet strawberry flavors so much I was taking spoonful after spoonful “just to taste”, this was by far my favorite dessert of the evening. I don’t know what Jersey wished for when he made his birthday wish, maybe it was for another birthday dinner at True Food next year. I have many vegetarian and several pescatarian friends, so I am always happy to find places which serve dishes they will eat. 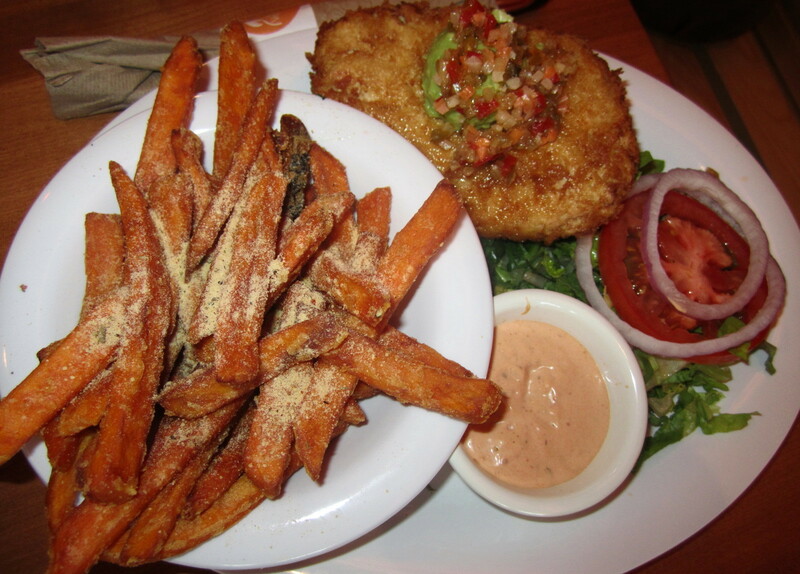 Of course it always helps if the options offered are tasty enough for me to happily forgo my meat, and I’ve written about a few restaurants in a previous post, but the Veggie Grill has now updated their menus and expanded their locations. Their latest outpost is at the Farmer’s Market next to the Grove and I was invited to their soft opening tonight before they officially open tomorrow. It’s always good to have a dress rehearsal before playing to the public and even with some technical difficulties, like the air conditioner on the fritz, the cast and crew performed flawlessly. I took my friend Mika, who is an omnivore, but like me, she has vegan friends. She had never been to this vegetarian friendly fast food chain (betcha can’t say that five times:) and she was so impressed that she literally yelled out in the restaurant, “This is delicious!” to all the servers. Mika ordered the Santa Fe Crispy Chickin’ $8.95, which is their Crispy fried chillin’ chickin’ (specially seasoned and marinated veggie protein blends), lettuce, tomato, red onion, and avocado, served with southwestern spiced vegan mayo. She opted for it served on Steamin’ Kale $1.50 instead of the wheat bun and she substituted the Sweetheart Fries $2.25 (you can also opt for a spring salad or mac and cheese as substitutions) instead of the red cabbage slaw or chili that normally accompanies the sandwiches. I was glad I got a taste of everything on her plate before she inhaled, because by the time she exhaled, her plate was clean. I was impressed by the crispy friend chillin’ chickin’ for both texture and taste; if children grew up eating this, they would never want “nuggets” again. The sweetheart fries were wonderful even without the chipotle ranch dipping sauce, and the spiced vegan mayo was surprisingly spicy. I learned from my last experience and ordered my salad dressing on the side when I chose the All Hail Kale salad $7.95. The kale and red cabbage in the salad are already marinated, so the extra dressing is overkill IMHO. The salad is served with roasted corn salsa, agave-roasted walnuts with a ginger-papaya vinaigrette, and I added blackened tempeh (a tender yet crunchy blend of organic soybeans and rice culture that is sautéed and grilled) for $2.50. I enjoyed the fresh ingredients and found the marinade tasty, but the tempeh was not the best; I found it bland, even though it was “blackened”, and a bit greasy. If you want added protein in your entree salad I would suggest you go for the chickin’. The walnuts added a nice sweet crunch and even though I did not add any more to my salad, the ginger-papaya vinaigrette had a nice bright zing. 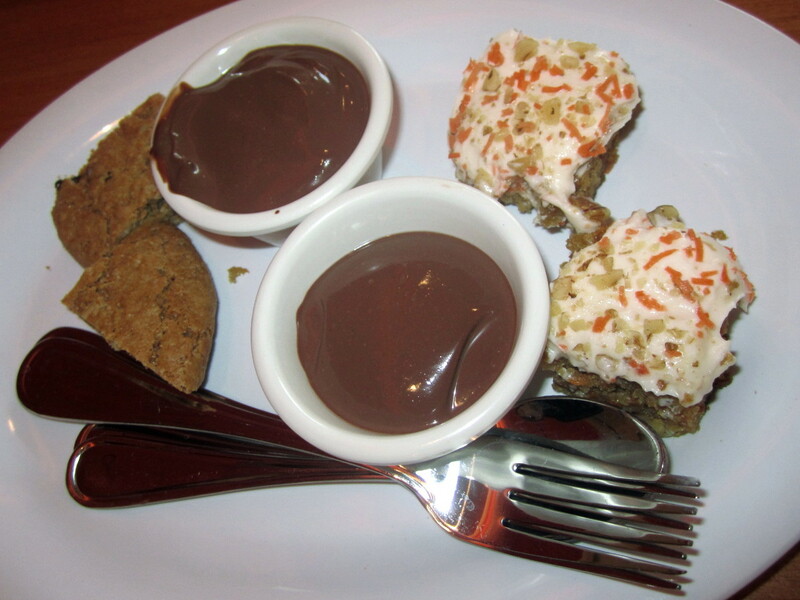 We got to taste all three dessert offerings which are all free of dairy, cholesterol and refined sugar. Neither Mika nor I liked the chocolate pudding because neither of us is a pudding fan, but she adored the carrot cake (she said it was the best she had ever eaten), but I found the frosting too sweet. I liked the chocolate chip cookie because it was not too sweet, which is exactly the same reason Mika did not like it. Having the freedom to choose is one of the great pleasures in life. Choosing for your taste while others choose for theirs is one of the reasons there are so many options for restaurants and on menus. It’s nice to find a vegetarian friendly restaurant where two omnivores have choices that please them enough to want to return. Green Peas is such clever name for a healthy restaurant that I decided to try it based on the name alone. The exterior has several outdoor tables, so since today was a perfect summer day, I combined my car’s oil change appointment with a vegan lunch to keep my body running smoothly. The menu has meat choices including beef and chicken, so this is a great place to come with friends who are either meat or vegan eaters. You can choose to have either meat or vegan protein in every dish, whether it is a salad, sandwich, pizza, or quesadilla for the same price. They use Gardein for the meatless versions of beef and chicken, and Daiya for the vegan cheese, so the quality of their products speaks volumes for the care they take in preparing their dishes. 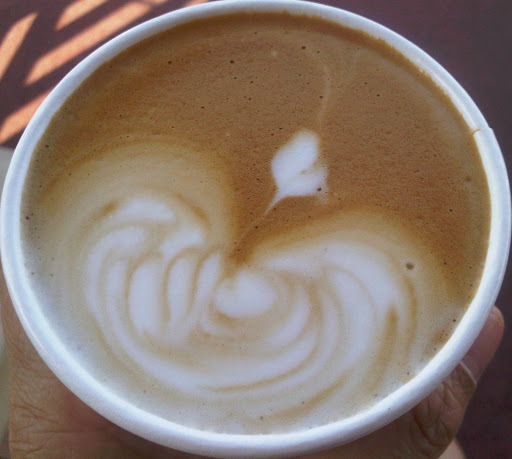 The coffee they serve is free trade and their vegetables are organic or local, so you can be green just by eating here. This is a casual place, so you order at the counter and they bring it to your seat. Since everything here is under $10, they save on things like printed menus; the only menu is written on a huge chalkboard above the counter and the servers are also the busboys. 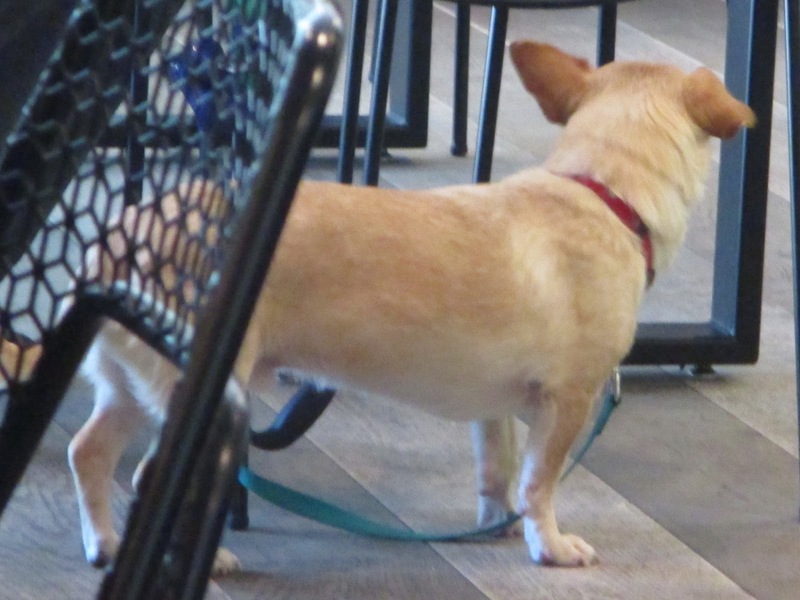 Since I had come in for a late lunch, they seemed a bit overwhelmed with the crowd; only one of the four empty tables was bussed and clean. I chose to sit on the patio and wiped down the table myself with some napkins. I ordered the Chicken Picatta Sandwich, made with Chicken breast, capers, garlic, fresh oregano, spinach, tomatoes, mozzarella cheese, pesto aioli and grilled onions ($9.95). I had a choice of soup, or salad with my sandwich so I chose the special creamy potato with garlic. 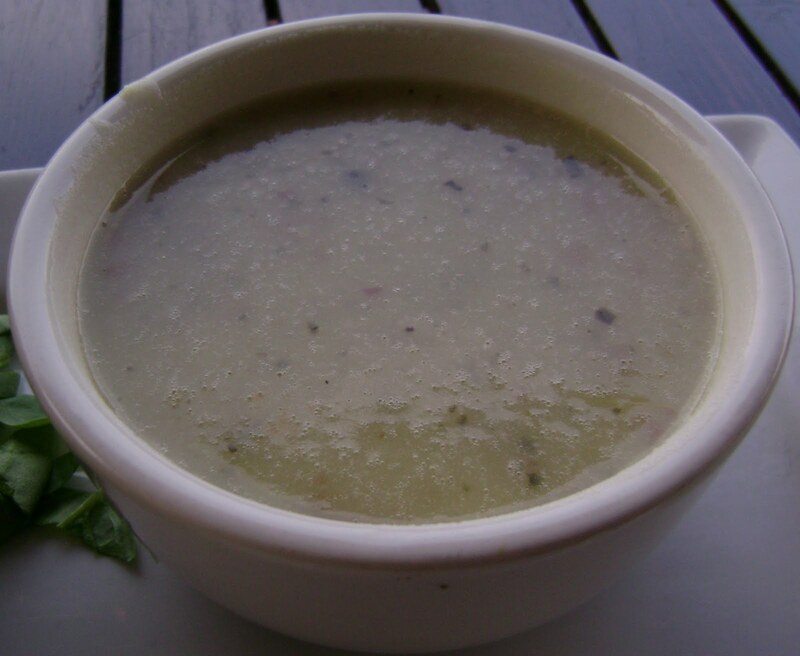 The soup was surprisingly tasty and rich for a nondairy soup. 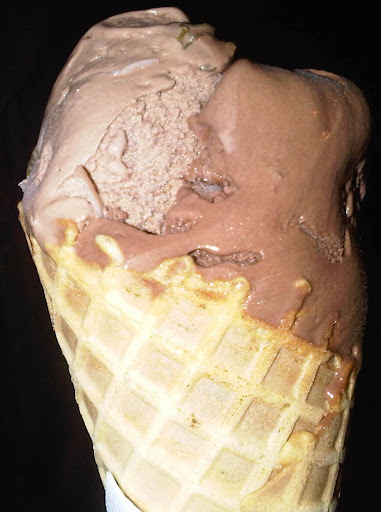 It had enough of a smooth mouth taste to satisfy even a cream loving non vegan. 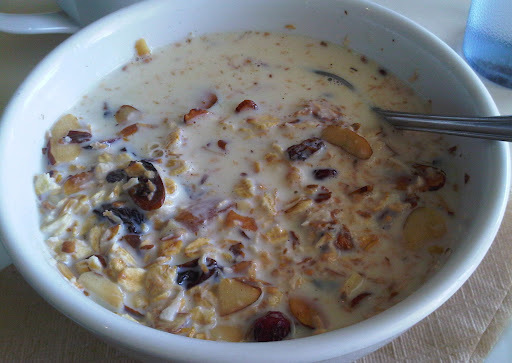 If it had not been a summer day, I would have wanted to have a big bowl of this for lunch. 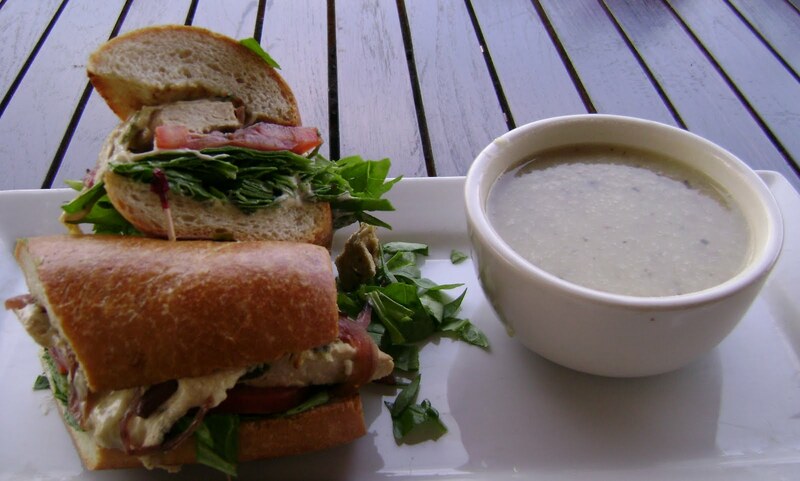 The Chicken Picatta Sandwich came on a lightly toasted baguette, but all their sandwiches give you a choice of other breads from whole wheat pitas, non gluten bread, and ciabatta, to sweet soft pretzel bread. Since I am so picky about baguettes, I thought it would be a good test and I am happy to say their baguette passed with enough texture to hold up to the sandwich and enough give to make chewing and biting easy. Since I chose the vegan Gardein chicken, I also got the veganaise and if I had not placed the order myself I would be hard pressed to say it was not the meat version. Although it was light on the capers, garlic, and grilled onions, it was a nice savory combination of ingredients that worked well together. 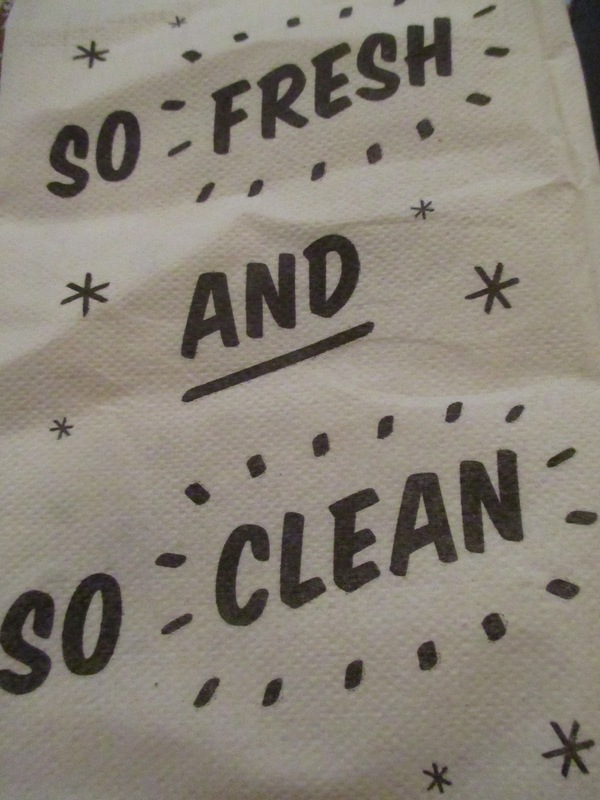 The server offered to wet wipe down my table when she brought out my meal, after I had done my napkin wipe, and it was nice to know they actually do get around to cleaning tables even if it takes them awhile to get to every table. The pots of flowers on the terrace are a pretty distraction from the bustling traffic on Sepulveda Blvd, and the free wifi seems to keep the place fairly full even in the later afternoon hours. I was watching the line at the fast food restaurant across the street and thought if those people would simply cross the street, they could have a healthier fresh choice. It is sometimes a huge step to simply try something new, so for everyone looking to be a little greener, this is a great place to start, even though I didn’t see any peas on the menu. No matter how old you are, birthday parties are fun. M Cafe is turning 5 tomorrow June 5 and from 5 to 7pm, everything on the menu at all three locations will be $5 (items less than $5 will be regularly priced). That means my favorite Tuna Tataki Salad, made with citrus-soy marinated tuna seared rare, over mixed baby greens with cucumber, avocado, kaiware sprouts, wasabi mayo, and ponzu vinaigrette which normally is $11.25 will be more than half priced! Even their popular The Bento Box (served cold) with assorted steamed vegetables, inari sushi, soba noodle salad, housemade pickles and carrot-ginger dressing with your choice of Organic Miso-Yaki Salmon, Albacore Tuna Tataki, or Shrimp, normally $11.25 is $5! 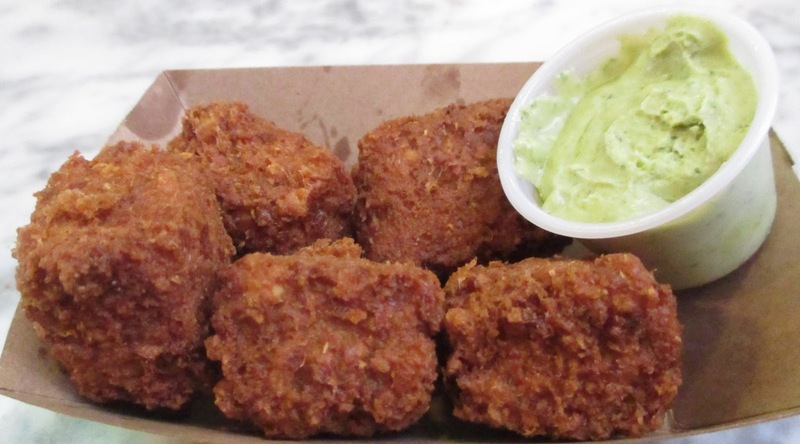 This is a great time to get someone who has never tasted vegan food to try it as your treat, just like many addictions, if you give them the first taste for free, they might get hooked for life! It’s always comforting to find that a restaurant I liked years ago is still doing a great job. I went shopping at Surfas and found some Peugeot salt and pepper mills ($44.88 each here, about $10 cheaper than at Sur La Table) and some demi glace to use for a decadent Boeuf Bourguignon. I looked over the menu at their new cafe Culinary District, and saw that they had great looking sandwiches, and a nice selection of prepared sides, so I will come back to try their food one day, but that day was not today because I wanted a salad, so I decided to head over to Tender Greens in Culver City for lunch. 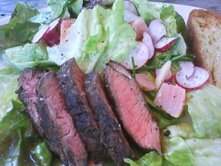 I chose one of their Big Salads (all are $10.50), the grilled Flatiron Steak, served with butter lettuces, chives, radishes, and delicious red and gold beets in a horseradish vinaigrette. It was truly big and if I had eaten more than toast for breakfast I would have had to take half of it to go; I managed to finish it, but could not fit in any dessert. My other favorite Big Salad is the tuna Nicoise served very rare (seared on the outside only), green beans, tomatoes, capers, potatoes, quail egg, and a sherry vinaigrette. I love the choices here that allow vegans and vegetarians to eat alongside omnivores with choices that are as interesting and varied as the meat centric dishes. 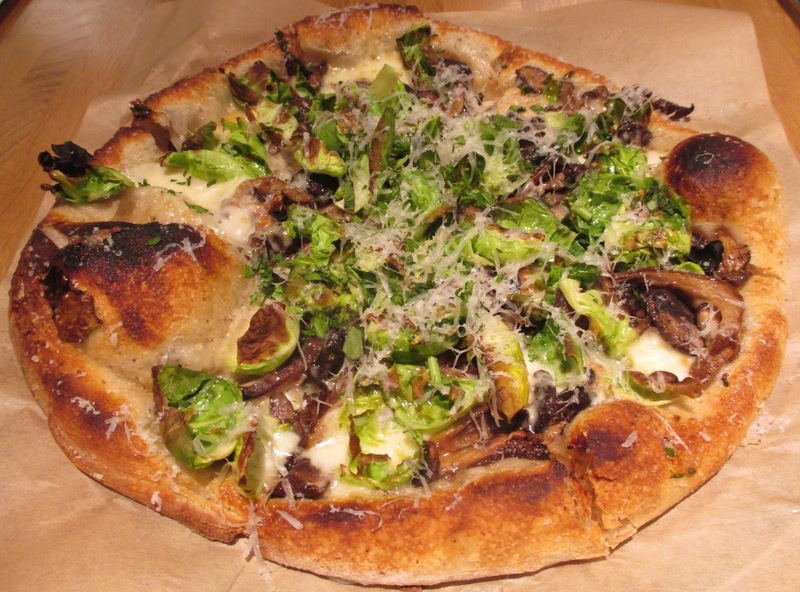 Meat eaters can choose chicken or steak on a hot plate with potatoes and vegetables, vegetarians can choose sandwiches or soups or a grilled veggie plate with hummus, and even raw food eaters have an option of eight raw vegetables with raw nuts. Options are one of the greatest joys of life, especially when it comes to food.